Amazon may be selling a tablet computer as early as October, report people familiar with the matter. The new tablet is expected to feature a 9-inch screen and run on Android’s operating system (but will reportedly not include a camera). An Amazon-designed second tablet may be available next year. Amazon is still expected to introduce two new Kindles in the third quarter. 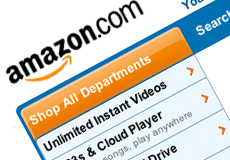 With its own online retail operation, Amazon is well positioned to compete with Apple. Moreover, one analyst says Amazon can offer a cheaper alternative and make up the difference with movie, music and book sales.